Ofsted Report April 2018 ...Ofsted acknowledge the significant improvements and recommend a Section 5 Visit so we can receive the Outstanding judgement we truly deserve! In January 2018, Ofsted changed the framework for inspecting schools. An inspection for ‘Good’ schools now consists of a team of inspectors for a one day visit (Section 8 Visit). The Ofsted team use the day to gather evidence, validate judgements, view teaching and learning and observe the culture of the school; the outcome being to determine whether the school is one of the below statements. For some schools this was a welcomed change, however I feel passionately as I am certain you do as parents and carers, that the agenda for education should be to acknowledge and celebrate a school and the community’s success. For Hampton this change was extremely disappointing. Feeling so strongly about the changes, we wrote to Ofsted in Term 3 requesting a Section 5 Inspection (a two day visit which allows the school judgment to be changed to outstanding) emphasising that the variation to the inspection framework did not allow Hampton the opportunity to demonstrate the significant and sustained year on year improvements and outcomes, and ultimately being validated as an outstanding primary provision. Unfortunately the framework stipulates ‘Good’ schools have to have a short (one day Section 8 Visit) inspection first! 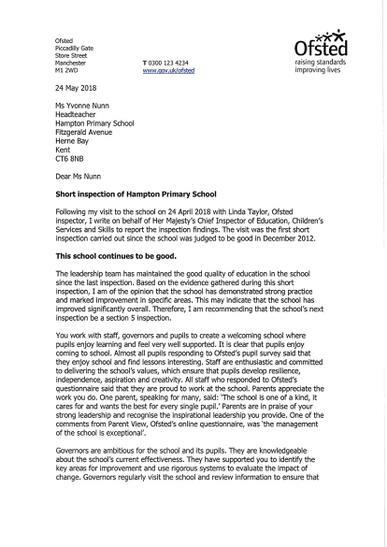 So the result for Hampton…following the evidence collected during our short inspection, I am incredibly proud to share that Hampton has been given the best possible result that Ofsted could award under these changes. The team were immersed into Hampton culture and shared in great detail at the end of the inspection the ‘exemplary practice observed…the embedded caring ethos… instilling of values and a place where children feel safe to make mistakes’ and have recommended a Section 5 Inspection within a short timescale due to ‘the strong practice and marked improvements seen’ so that we can receive the Outstanding judgment that Hampton community truly deserve! With that I would like to extend my sincerest thanks to you as parents and carers for your continued support and faith you have in Hampton. Your parent view comments were heart warming and demonstrate our strong partnership with you. I also need to extend my deepest gratitude to every staff member whose commitment and passion to your children is unwavering. Our ethos of equity for every child achieving the very best they can is reflected in our results and in what your children say about their school. This is testimony to the strength of Hampton community. We will continue to provide the very best experiences for your children and await Ofsted’s return! 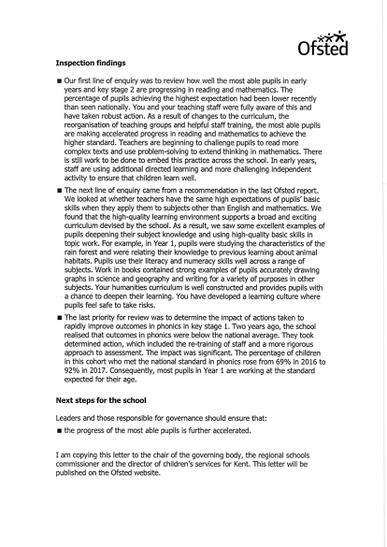 When inspectors think a school may be showing marked improvement towards an outstanding judgement, Ofsted will not convert the inspection. Instead, a letter will be published confirming that the school is still good. The letter will set out the school’s strengths and priorities for further improvement. A section 5 inspection will then take place within 1 to 2 years. This gives the school time to consolidate its strong practice and demonstrate it is outstanding. The school remains ‘good’ and provides a good standard of education. The next inspection will be another Section 8. When there are no significant issues with safeguarding or behaviour, but inspectors identify potential concerns about either the quality of education or leadership and management, the inspection will not convert. 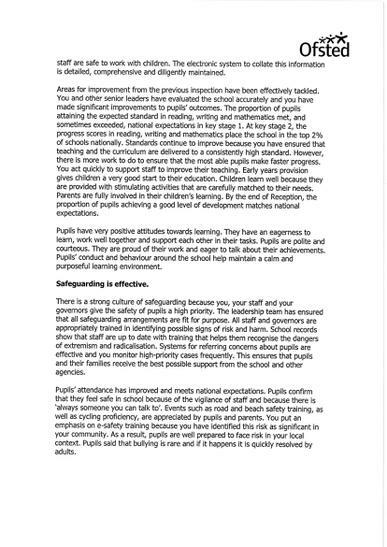 Instead, Ofsted will publish a letter setting out the school’s strengths and areas for improvement. A section 5 inspection will then take place later, typically within 1 to 2 years. This will give the school time to address any weaknesses and seek support from appropriate bodies. 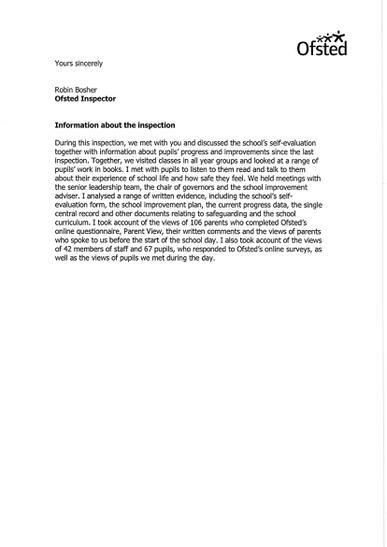 In the meantime, the letter will be clear that the school’s current overall effectiveness judgment has not changed, so the school remains ‘good’.